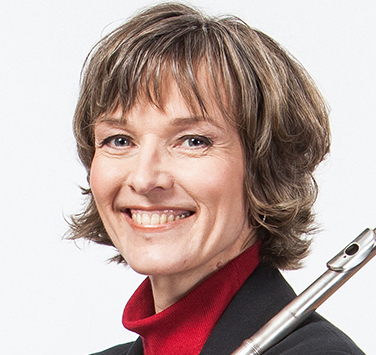 Born and raised in Oshawa, Ontario, Christine Feierabend moved to Halifax from Toronto in 1989 as a result of winning her current position with Symphony Nova Scotia as Second Flute and piccolo player. Christine holds a Bachelor of Music in performance from the University of Toronto and a Master’s Degree from the Juilliard School in New York. In Nova Scotia, she appears regularly at the Music Room and has played chamber music at Scotia Festival, on the Faculty Series at the Maritime Conservatory of the Performing Arts, on the St. Cecilia Summer Concert Series, and on the Three Churches Summer Series in Mahone Bay. Before coming to Nova Scotia, Christine played as an extra with the Toronto Symphony and Hamilton Philharmonic. Christine has been a member of the National Youth Orchestra of Canada and a fellow of the Tanglewood Festival Orchestra. She lives in Kingswood with husband Mike and their two children, Stephen and Nicola. How long have you played the flute? Many years. I started when I was given one for Christmas at the age of 13. My first lesson was with my older brother, who was a year ahead of me in school and who had some band experience playing the clarinet. His comment was that my sound was too “airy.” I had no idea what kind of a sound a flute was supposed to make, so I started listening to the background music of movies I watched on TV. My first lesson with a flute teacher was a few years later, and I went in thinking, “Well, she won’t be able to fault my sound – no airiness there!” — but that was the first thing she criticized. My sound had become too much of a laser beam, so I guess my initial lesson with my brother made me take things a bit overboard! I am a flute instructor at Dalhousie and also I teach privately at my house in Kingswood. I teach because it is very rewarding. I’ve had students that have played on their own (no lessons ever) for sometimes years and after just a couple of tips, they can suddenly do things they had never thought possible. Lessons can save hours of work and useless practice. I also like to teach because it makes me analyze what I am doing when I play and therefore I can fix my own problems as they come up. I love to read. That seems to be the most effective way for me to unwind. It also requires a healthy dose of chocolate to make the experience complete. Something about you that people may find surprising? I love to organize other people’s stuff.